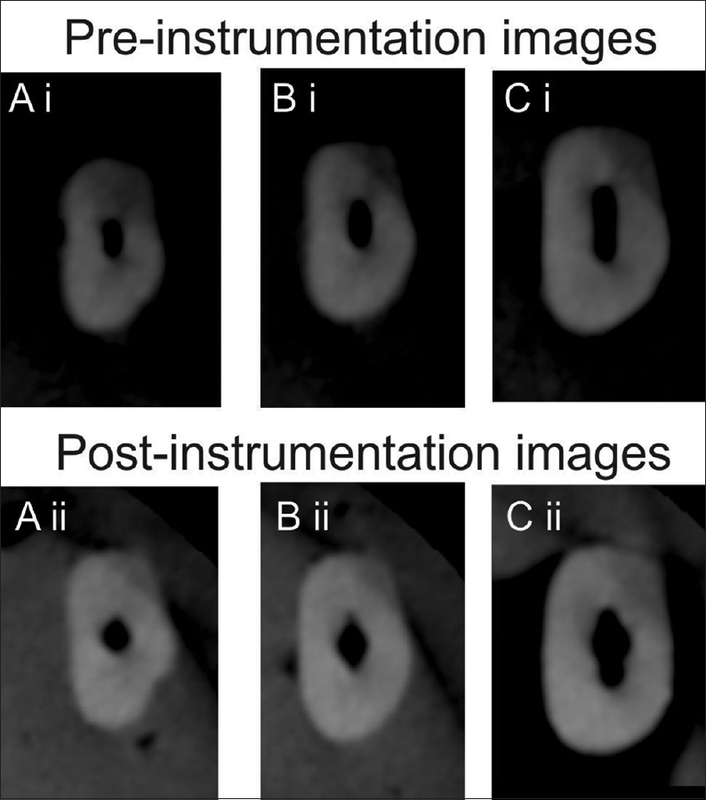 Context and Aims: The purpose of this study was to compare and evaluate the shaping ability of ProTaper (PT) and Self-Adjusting File (SAF) system using cone-beam computed tomography (CBCT) to assess their performance in oval-shaped root canals. Materials and Methods: Sixty-two mandibular premolars with single oval canals were divided into two experimental groups (n = 31) according to the systems used: Group I – PT and Group II – SAF. Canals were evaluated before and after instrumentation using CBCT to assess centering ratio and canal transportation at three levels. Data were statistically analyzed using one-way analysis of variance, post hoc Tukey's test, and t-test. Results: The SAF showed better centering ability and lesser canal transportation than the PT only in the buccolingual plane at 6 and 9 mm levels. The shaping ability of the PT was best in the apical third in both the planes. The SAF had statistically significant better centering and lesser canal transportation in the buccolingual as compared to the mesiodistal plane at the middle and coronal levels. Conclusions: The SAF produced significantly less transportation and remained centered than the PT at the middle and coronal levels in the buccolingual plane of oval canals. In the mesiodistal plane, the performance of both the systems was parallel. An ideal endodontic instrumentation technique should uniformly prepare all the surfaces of the canal while simultaneously preserving the sound peripheral dentin. However, complete debridement of the root canal becomes difficult to achieve because of variations in root canal anatomy. An oval-shaped root canal, for instance, can pose a special challenge for adequate chemicomechanical preparation resulting in uninstrumented recesses. Instrumentation techniques utilized for the preparation of oval canals include circumferential hand filing, rotary nickel-titanium instruments as well as sonic and ultrasonics. However, none have succeeded in completely preparing the canal while simultaneously preserving the oval-shaped canal anatomy. Thus, innovations are being targeted toward newer instrument designs and techniques to enhance cleaning and shaping of such canals. The newly developed Self-adjusting File (SAF; ReDent-Nova, Ra'anana, Israel) is designed as a lattice-walled cylinder which adapts itself three-dimensionally according to shape of the root canal. It is the first file system that has a hollow metal shaft which allows for delivery of a continuous flow of irrigant. In a recent histologic study, it has shown promising results in debridement of oval root canals. The ProTaper file system (PT; Dentsply Maillefer, Ballaigues, Switzerland) is among the most popular rotary systems currently available. A convex triangular cross-section, progressive taper, changing helical angle and a noncutting, modified guiding tip characterize the instrument design. These features may contribute to improve the file flexibility and help to achieve a centered preparation. An ideal root canal preparation should have a continuous, tapering conical shape while maintaining original canal configuration. Failure to maintain the canal anatomy can result in iatrogenic endodontic mishaps or root fractures., Hence, the ability of endodontic instrument to stay centered and prevent canal transportation is critical. Various methods such as radiography, scanning electron microscopy, histologic sections, silicone impression, computed tomography (CT), cone-beam CT (CBCT), micro-CT, and stereomicroscopy could be used to assess the shaping abilities of endodontic instruments. Currently, CBCT has been widely used for noninvasive evaluation of canal centering abilities of endodontic instruments. Since the PT and SAF are designed for optimal cleaning and shaping, we hypothesized that both the systems would be able to prepare oval canals effectively. This study aimed to compare and evaluate the canal centering ability and canal transportation of PT and SAF in oval-shaped root canals of mandibular premolars. After approval by the Institutional Review Board, 150 human, single-rooted freshly extracted human mandibular premolars, extracted for periodontal or orthodontic reasons were collected. The teeth were stored and handled according to the Center for Disease Control and Prevention guidelines. Teeth with oval-shaped canals, where the buccolingual canal diameter was at least two times the mesiodistal diameter as measured at the CBCT slice 5 mm from the apex. The scanner Kodak CS 9300 (Carestream Health Inc., NY, USA) operating at 90 kV, 10 mA with an FOV 5 cm × 5 cm, resolution of 90 μm, and exposure time of 18.6 s was used along with CS 3D Imaging Software 3.3.11 (Carestream Health Inc., NY, USA). Further, only teeth with straight roots or those with canal curvature <10° were included in the study. Thus, 62 teeth were included in the study and each tooth was de-coronated to a standardized root length of 12 mm. The working length was established by inserting a size 10 K-file to the root canal terminus and subtracting 1 mm from this measurement. Glide path was prepared using size 15 K-file up to the working length. The selected roots were then mounted with their long axes perpendicular in a wax block to facilitate precise repositioning of the pre- and post-preparation CBCT images before and after instrumentation and randomly divided into two experimental groups (n = 31) as follows: Group I – PT system and Group II – SAF system. In both the groups, instrumentation was done according to manufacturer's instructions using a new file for every tooth in both the groups. 2.5% sodium hypochlorite was used as an irrigant and Glyde (Dentsply Maillefer) as a lubricant. In the PT group, using an electric motor (X-Smart; Dentsply Maillefer) with a 16:1 reduction handpiece, a new set of rotary S1-F2 instruments was used in a sequence to prepare each sample. Each sample in the SAF group was prepared using a new 21 mm/1.5 mm SAF file attached to an EndoStation endodontic motor and RDT3 handpiece (ReDent Nova) operating at a frequency of 5000 oscillations per minute and amplitude of 0.4 mm. A continuous short pecking motion was used for 4 min while maintaining the irrigant flow rate at 4 mL/min. 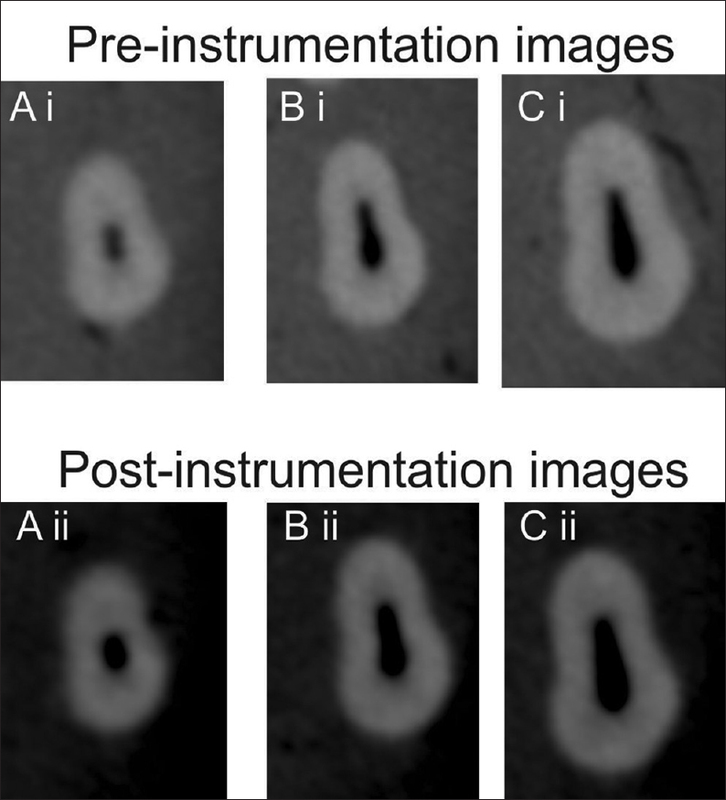 Pre- and post-operative evaluation of all the samples was made using previously mentioned CBCT parameters [Figure 1] and [Figure 2]. Canal transportation and the centering ratio were calculated at the 3-, 6-, and 9-mm axial cross-sections from the apical end of the root by using the following equations. Mesiodistal plane: (m1 − m2)/(d1 − d2); buccolingual plane: (b1 − b2)/(l1 − l2). The bigger figure was taken as the denominator. A result of one indicated an ideal outcome and a result closer to zero indicated poor centering ability. Mesiodistal plane: (m1 − m2) − (d1 − d2); buccolingual plane: (b1 − b2) − (l1 − l2). The closer to zero the value obtained, the lesser was the canal transportation. shortest distances from the buccal margin of the root to the buccal margin of the uninstrumented and instrumented canals, respectively; l1, l2 - shortest distances from the lingual margin of the root to the lingual margin of the uninstrumented and instrumented canals, respectively. The mean and standard deviation of the values of centering ratio and canal transportation were obtained for the PT and SAF groups at the 3, 6, and 9 mm levels (SPSS 15.0; SPSS Inc., Chicago, IL, USA). One-way analysis of variance and the post hoc Tukey's test were performed for intragroup comparison. Inter- and intra-group t-test was carried out. Canal transportation and centering ability were compared in the mesiodistal and buccolingual planes using t-test for each group. The significance level was set at P ≤ 0.05. The results of the canal centering and canal transportation are detailed in [Table 1] and [Table 2]. The ANOVA gave a P value of 0.000 (P < 0.05). PT showed significantly lesser transportation and better centering ability in the mesiodistal plane as compared to the buccolingual plane at the 6 and 9 mm level. In the mesiodistal plane, the centering ability was best at the 3 mm level, followed by the 6 and 9 mm level. Similarly, at the 3 and 6 mm level the PT had significantly lesser canal transportation than at the 9 mm levels. In the buccolingual plane, it had significantly better centering ability and lesser canal transportation at the 3 mm level than at the 6 or 9 mm levels. At the 6 and 9 mm level, the SAF had statistically significant better centering and lesser canal transportation in the buccolingual as compared to the mesiodistal plane. In the mesiodistal plane, the centering ability was best, and canal transportation was least at the 3 mm level, followed by the 6 and 9 mm levels. In the buccolingual plane, it showed better centering ability and least canal transportation at the 6 mm level followed by 9 and 3 mm levels. When both the systems were compared, in the mesiodistal plane, there was no statistically significant difference in the centering ability and canal transportation of PT and SAF at all levels. However, in the buccolingual plane, the SAF performed significantly better, i.e., showed better centering and lesser canal transportation than the PT at the 6 and 9 mm levels. Thus, the null hypothesis was rejected. The present study evaluated the centering ability and canal transportation of PT and SAF system in oval-shaped root canals of mandibular premolars using CBCT. Evaluation of the postoperative canal shape aids in assessment of the safety and efficacy of endodontic systems. Evaluation of canal transportation and centering ratio are influential parameters to analyze the quality of root canal preparation achieved with instruments and techniques. Canal transportation is a measurement of the extent and direction of deviation of a canal following instrumentation. Centering ratio is a measurement of the ability of the instrument to stay centered in the canal. It may aid in understanding the advantages and limitations of specific design characteristics of instrument systems. Due to canal transportation, endodontic instruments do not touch the complete perimeter of root canal leaving debris, microorganism, thus contributing to endodontic failure and affects the biological sealing of the obturating material. Incompatibility of the prepared root canal with the original root canal anatomy leads to compromised fracture resistance of the tooth. CBCT provides a highly precise three-dimensional noninvasive tool for the evaluation of changes in canal geometry following instrumentation. It permits nondestructive analysis of variables such as volume, surface area, cross-sectional shape, and taper of the root canal system. In the present study, CBCT enabled the calculation of canal transportation and centering abilities of both the endodontic systems. Flat oval root canals are frequent in the distal roots of lower molars, upper and lower bicuspids, and lower incisors and canines. Since the flatness in these canals is usually in the buccolingual dimension, it is infrequently diagnosed in clinical radiographs. However, a study by Wu et al. has revealed that oval or flat root canal morphology is present in up to 25% of root canals, and in some root groups, it may exceed 50%. Such oval canals present with an anatomic challenge for chemomechanical preparation., Hence, human extracted lower premolar teeth with oval canals having buccolingual canal diameter at least two times the mesiodistal diameter were chosen for this study to mimic clinical situations. Accordingly, the values for centering ratio and canal transportation were calculated in both the buccolingual and the mesiodistal planes. To control the variability in root length, the teeth were decoronated keeping a standard root length of 12 mm. In the present study, three cross-sectional levels were chosen: 3, 6, and 9 mm to represent the apical, middle, and coronal thirds of root canals. Three significant design features characterize the PT files, namely, progressive taper on a single file, convex triangular cross-section, and the changing helical angle. These features could help to improve flexibility, minimize the engagement between the file and dentin and enhance augering of debris out of a canal; suggesting improved centering and shaping ability. However, all rotary instruments with a solid metal core tend to produce a rounded preparation irrespective of their design characteristics.,, In narrow oval canals, especially, it results in a circular-shaped preparation either in the center or toward one pole of the canal. Hence, in oval canals, while the central portion of the canal is instrumented, buccal and lingual recesses remain untouched., This may explain why the PT maintained the canal shape better in the mesiodistal plane than the buccolingual plane at the coronal and the middle thirds. Further, since the long diameter of the oval root canals generally decreases apically; the shaping ability of the PT was best in the apical third, both in the mesiodistal and buccolingual planes. This is in agreement with CBCT studies by Tambe et al. and Hashem et al. evaluating the transportation and centering ability of the PT that also showed better shaping at the apical level than at the middle and coronal. The SAF file is a hollow-pointed cylinder composed of a thin nickel-titanium lattice. The compressible open tube adapts itself to the canal anatomy three-dimensionally and exerts uniform lateral pressure on the dentinal walls. In addition, the absence of a rigid metal core makes the file highly flexible. When a 1.5 mm SAF is inserted into a canal measuring 0.2 mm mesiodistally, it spreads buccally and lingually up to a dimension of 2.4 mm 3. Thus, the SAF worked better in the buccolingual plane in the middle and coronal sections. None of the two systems evaluated had perfect centering ability and zero canal transportation. Comparison of both the systems in the mesiodistal plane showed that PT was marginally better than the SAF. However, the difference was not statistically significant. Since the shorter diameter of oval canals is along the mesiodistal direction; this result is understandable given the fact that the PT is a rotary system. While we came across, no studies comparing the shaping ability of SAF and PT, a morphometric and histologic evaluation of the quality of debridement of oval canals by De-Deus et al. showed that the SAF was significantly more competent in debridement of oval root canals than rotary PT. A microcomputed tomographic study by Versiani et al. showed significantly greater mean increases of area/volume as well as the percentage of prepared walls of oval canals with SAF than with rotary instrumentation using K3. The study concluded that using the SAF protocol, flat-oval canals were uniformly and circumferentially prepared. Within the parameters of this study, in oval-shaped canals, SAF produced significantly less transportation and remained centered than the PT at the middle and coronal levels in the buccolingual plane. However, in the mesiodistal plane, the performance of both the systems was comparable. Further studies are needed to extrapolate these results to clinical conditions. Wu MK, R'oris A, Barkis D, Wesselink PR. Prevalence and extent of long oval canals in the apical third. Oral Surg Oral Med Oral Pathol Oral Radiol Endod 2000;89:739-43. Hilaly Eid GE, Wanees Amin SA. Changes in diameter, cross-sectional area, and extent of canal-wall touching on using 3 instrumentation techniques in long-oval canals. Oral Surg Oral Med Oral Pathol Oral Radiol Endod 2011;112:688-95. Metzger Z. The self-adjusting file (SAF) system: An evidence-based update. J Conserv Dent 2014;17:401-19. De-Deus G, Souza EM, Barino B, Maia J, Zamolyi RQ, Reis C, et al. The self-adjusting file optimizes debridement quality in oval-shaped root canals. J Endod 2011;37:701-5. Gonçalves AN, da Frota MF, Sponchiado Júnior EC, de Carvalho FM, da Fonseca Roberti Garcia L, Franco Marques AA. Apical transportation of manual NiTi instruments and a hybrid technique in severely curved simulated canals. J Conserv Dent 2015;18:436-9. Ruddle C. The ProTaper technique: Shaping the future of endodontics. Endod Topics 2005;10:213-6. Schilder H, Yee F. Canal debridement and disinfection. In: Cohen S, Burns RC, editors. Pathways of the Pulp. 11th ed. St. Louis, MO: Mosby; 1984. p. 175-204. Kandaswamy D, Venkateshbabu N, Porkodi I, Pradeep G. Canal-centering ability: An endodontic challenge. J Conserv Dent 2009;12:3-9. Kumar SR, Gade V. Canal-centering ability. Med Sci 2014;10:246-8. Gundappa M, Bansal R, Khoriya S, Mohan R. Root canal centering ability of rotary cutting nickel titanium instruments: A meta-analysis. J Conserv Dent 2014;17:504-9. Gambill JM, Alder M, del Rio CE. Comparison of nickel-titanium and stainless steel hand-file instrumentation using computed tomography. J Endod 1996;22:369-75. Wu MK, Fan B, Wesselink PR. Leakage along apical root fillings in curved root canals. Part I: Effects of apical transportation on seal of root fillings. J Endod 2000;26:210-6. Moura-Netto C, Palo RM, Camargo CH, Pameijer CH, Bardauil MR. Micro-CT assessment of two different endodontic preparation systems. Braz Oral Res 2013;27:26-30. Metzger Z, Teperovich E, Zary R, Cohen R, Hof R. The self-adjusting file (SAF). Part 1: Respecting the root canal anatomy – A new concept of endodontic files and its implementation. J Endod 2010;36:679-90. Ruddle C. The ProTaper advantage: Shaping the future of endodontics. Dent Today 2001;10:1-9. Elayouti A, Chu AL, Kimionis I, Klein C, Weiger R, Löst C. Efficacy of rotary instruments with greater taper in preparing oval root canals. Int Endod J 2008;41:1088-92. Adigüzel O. A literature review of self adjusting file. Int Dent Res 2011;1:18-25. Hof R, Perevalov V, Eltanani M, Zary R, Metzger Z. The self-adjusting file (SAF). Part 2: Mechanical analysis. J Endod 2010;36:691-6. Versiani MA, Pécora JD, de Sousa-Neto MD. Flat-oval root canal preparation with self-adjusting file instrument: A micro-computed tomography study. J Endod 2011;37:1002-7. Tambe VH, Nagmode PS, Abraham S, Patait M, Lahoti PV, Jaju N. Comparison of canal transportation and centering ability of rotary ProTaper, one shape system and wave one system using cone beam computed tomography: An in vitro study. J Conserv Dent 2014;17:561-5. Hashem AA, Ghoneim AG, Lutfy RA, Foda MY, Omar GA. Geometric analysis of root canals prepared by four rotary NiTi shaping systems. J Endod 2012;38:996-1000.